It's been a big year for GameFront, following the closure of the site by Defy Media back in 2016 a dedicated team of volunteers have worked very hard to restore the site, with the support of DBolical, and despite the countless hours, sleepless nights and coffee-fuelled days, we've not always gotten it right first time. We hear you; the categories system has been in need of some major improvements. It's great having a massive archive of amazing mods and gaming files, but if navigating that archive is a chore, then the point of having such a collection is ultimately defeated. We understand this - that's why we've made some significant changes already and we're going to introduce more over the coming weeks. The most principle issue was how files within file categories were displayed - our approach originally was to emulate what the old "FileFront Network" sites had done, which was to display files in a table view, a list effectively - it seemed like a logical starting point to re-create what had gone before, as it seemed to work then, why not now? We understand this was the wrong approach - users would much rather be able to get a visual representation of the archive than a textual one - this is more in keeping with the modern internet. It's not like we're all using 56k modems and bandwidth is at a premium anymore. Sites like Pinterest show us that browsing visually is a much more rewarding experience for the end user. 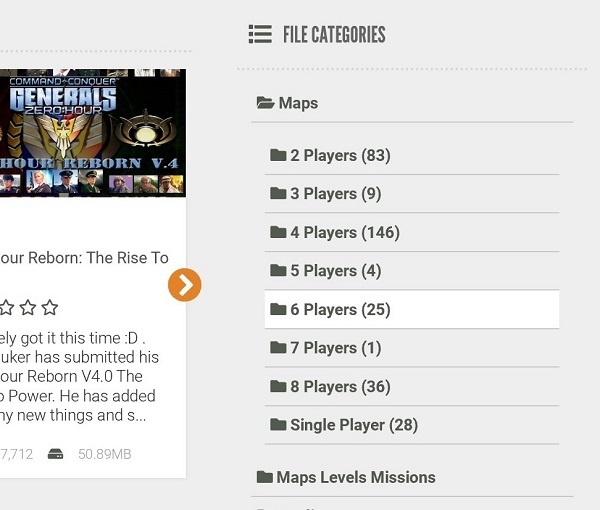 To that end, we've now completely changed how files within categories are displayed - gone is the grid and table view of old, to be replaced with the more modern "cards" layout seen elsewhere on the site - displaying a screenshot for the mod if available - along with all other pertinent data such as ratings, descriptions and more. This isn't the only change, though. Work has now already started on a massive spring-cleaning operation on all file categories, starting with our most popular games. The restoration of GameFront was a particularly challenging one. To explain how the old GameFront worked - it was basically separated into two completely separate websites / applications that never properly integrated with each other. On the one side was the FileFront Network, previously called "FilesNetwork", which was a bespoke system that operated all of the individual subsites that users loved - an example of this would have been jediknight.filefront.com for example, which covered all the Jedi Knight games. The other half was the main GameFront website, which was a mixture of WordPress and custom code, that not only served as a file repository for all the Network subsites, but also had it's own collection of games and files, stored in a completely different database in a completely different way. In addition, the forums were also a separate app, running on vBulletin. This situation was never an ideal or acceptable one, and it's one we chose to address during the rebuild - but of course this was never going to be an easy feat to accomplish. Importing databases from four separate codebases into a single, unified app was never going to be a smooth process - frankly many said it could never be done - and it's a matter of great credit to our resident lead developer Mikey that it was pulled off. One of the side effects of this issue, however, was the fact that each database stored file categories in a completely different way. One of the net results of this was that categories for all games would often be duplicated with slightly different names - for example you could have a "Mods" category with a nice set of subcategories for a fair bunch of mods, but then a totally separate "Modifications" category with a bunch more mods lumped in. This causes confusion and frustration for our users. We get it. So we're having a major clean up operation of these categories now. We've already done some major tidy-ups of major games like the Knights of the old Republic series and Bridge Commander, two of our most popular games, among many more, and we hope you'll agree that the changes are indeed most welcome. We've already done over 40 games, and work on this continues. We're not ending it there, though. We understand that there's still much more work to be done. File categories need to be sortable, and this is one thing that is already under active development. It's great having a huge category stuffed with content, but it would be much better to be able to sort that category by the most downloaded, highest rated, most recent, or even simply put it into alphabetical order. Search is another area that will be given some enhancements over the coming weeks. Currently our search engine can find games, files, articles or forum content - but there's little in the way of advanced search tools. Searching by mod author, filename, or description would all be very welcome enhancements that should make finding the content you're after much easier. We're always working on making the site better and for that we need your help! You've said, we've heard, but we know there's still so much more to do. We welcome you to leave comments below or post on our forums, or contact us via our ticket system. We listen to all feedback and where possible implement changes as fast as we possibly can.